"Cold /numb/and boring would be our world without Feeling, Mood and Emotion"- David Diamond 2013 My art seeks to surprise , delight, intrigue, and challenge . It is created for visual stimulation; in it you will see differing objects and dimension with visual eye movement in both form and color . As both a 2 and 3 dimensional artist i 'move' between both in my artwork; I seek a balance between the loose and dynamic curvature of sculptural abstraction and the planar and vibrant potential of geometric abstract painting My Sculpture: At once sensual, curvaceous, botanical, feminine, surreal, loose and complex; you want to reach out , touch , and caress the forms. 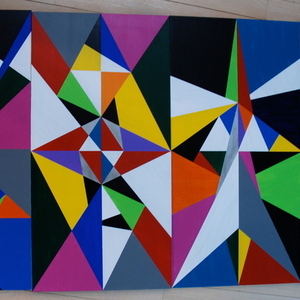 My Painting: Geometric individually constructed squares and totems that can be combined into a mosaic. Place one on a wall, or two or ten or twenty and there emerges a new abstraction that begins to suggest that the pieces at intersections are at one and continuous in form....like a blanket or mosaic tapestry. In mosaic form you begin to see different forms and dimensions and the colors begin to challenge each other and bounce forward and backwards on the board. Your eye does not know what way to look first. Mood, feeling and emotion emerge upon your walls.